I hope you are still all reading the blog thingy even though I have not posted for two days, I am truly sorry and hope you forgive me. Let me start by saying a big thank you to Heidi for looking after the ship during my two days at home. I left home yesterday at 5 am to catch my flight back to Rome. It was only a two-hour flight but after travel time, security checks and the flight itself, I was quiet tired when I got back to the ship at 2 pm. The flight back was uneventful except for a few a very rude flight attendant named Regina who scowled and tutted anytime anyone asked for anything. Someone had definitely taken all the jam out of her doughnut that morning. Back on board, I hugged and kissed my wife and then got straight back down to the business of being a cruise director with a travel talk at 4 pm and a mountain of e-mails to catch up on. The travel talk went well except for a man in the third row who slept from the moment I walked out and forty minutes later when I had finished and walked off stage he was still asleep………..jet lag……………anybody got any home remedy cures? I want to thank you all for taking the time to read my blog about Maddy, the little girl who is still missing after being abducted in Portugal. Please keep her photo in your head as you travel the world and keep a prayer in your heart for her safe return. Here are some great photos of the Carnival Destiny. 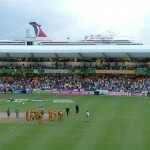 The ship was in Barbados for the Cricket World Cup final which was played between Australia and South Africa. 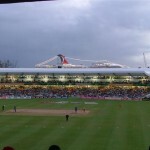 I would explain the laws of Cricket but time does not allow, however if you need to know please mail, a comment to this blog thingy and ask my PA who is cricket mad and will answer all your questions. Congratulations to Costa Cruise Lines, part of our family who just launched their new ship, the Costa Serena. We all wish her Bon Voyage. I must push on with the Q&A because I am many days behind, so ……………here it is an XXXXXXL helping of Q &A. AND WE START WITH, WHO ELSE………………. BIG ED – We are both famous now in Japan thanks to the links you showed me. I guess we will need to be called John Healdasaki and Big Edushi. Aragato Big Edson. Thank you for the birthday wishes for Mum and she has been given strict instructions not to send any photos of me as a baby…………I certainly was not BIG JOHN ! How about a photo of you as SMALL ED ? Hello Mrs. Big Ed – Heidi here. Although I missed John, I really enjoyed a “clean” toilet seat and a full view of the carpet. Still, I was a little nervous not having John here but all was well. Thank you for thinking of me. ANGELA – I am sure you and your group are getting very excited now as your cruise is just a few weeks away. In answer to your question, we do have tables for 10 but not 12. have you requested a table for 10? If not and you want to, let me know and I will see what I can do for you. See you soon. DORTHE CALIMBAS – First of all, thank you for your kind words about buying the book. I am talking with our vice president of marketing sales Christine Arnholt and she is working with me to get this done ASAP. Now, you spoke about the Royal Princess. Here then is breaking news from my hard working PA on that subject. Royal Princess just joined the Princess fleet she was formerly Minerva II formerly R8. If they want to know where is the previous Royal Princess, she is operating happily as P&O’s Artemis. Many thanks to my PA for this information, I know it takes hours of research from his cubicle back in our HQ in Miami. MARK TWAIN AND A HALF – Thank you for the book request and I am working on getting all these blogs published as quick as I can as well as adding some new ones. It seems that many of the blog readers want this so I will let you know as and when it happens. I would hope it can be in all good used book stores by Christmas 🙂 Buy them one for Christmas, they will make great stocking fillers. My blog book will also be very useful when camping and you run out of toilet paper as the book will be very absorbing. Thank you also for your great comments regarding “local and ethnic entertainment.” I agree wholeheartedly that we all need to immerse ourselves as much as possible in diverse cultures which in turn will help us all understand how the other half lives. Heidi says that’s just an excuse to get a Belly Dancer onboard ! On the Carnival Splendor I really want to do some new and exciting things and we have time to plan the. One event we must do is a BEER FEST. We will hire a German “oompa” band (I have no idea how to say that) and have a beer fest with the stein glasses. I also want to get some typical Dutch entertainment but I think its illegal. On a serious note, I do think that we can do much more to use the local people to show us their history through music. Let’s see if we can. I loved your comment about Guido having to practice to get to the West End. I did feel a little guilty pretending that I was still listening to the MP3 thing but I needed to rest my voice, I wonder if Guido found his way OK? Thanks again for reading the blog thingy and I hope you continue to do so. CAROL SCHOENBERGER – hello Carol and thanks for slapping a comment on the blog thingy. You are correct that the new Royal Princess was named by someone who has been onboard a Princess Ship for 4,000 days. She has never been able to find the gangway to get off. As for the Carnival Splendor’s naming ceremony If it were up to me I would do the following. 1. CEREMONY IN DOVER, U.K.
2. PRE CRUISE ENTERTAINMENT TO BE PROVIDED BY THE BAND OF THE HER MAJESTY’S WELSH GUARDS….we had the Royal Marine Band for the Carnival Legend and they were fantastic. The Welsh guards are the best military band in the world and look so resplendent in their buzzbys (hats). 3. DAME VERA LYNN WILL SING “WHITE CLIFFS OF DOVER”……..Dame Vera was called “The Allied Force’s Sweetheart” during WWII and her signature tune was this song. Her singing this to the accompimant of the Welsh Guards would be amazing and if we cannot get Angelina, then Dame Vera Lynn would create a huge buzz in the UK as godmother, I bet nobody has ever had a godmother who sings live at the ceremony and especially a song that means so much to US and Allied veterans of WWII. So Carol, lets see what happens and thanks for asking, yes I had a great time at home. See you soon. INEZ AND DEAN – Thank you for giving me a chance to congratulate ALL ABOUT CRUISES based in Burlington, North Carolina who was named by Carnival as their AGENCY OF THE YEAR. I salute them and all the agents around the world for their continuing support. Congratulations also to you for booking THE CARNIVAL SPLENDOR. It will be an historic trip for you both to enjoy and I know your granddaughter will be amazed at what she will see. I am glad I convinced Dean to sail and as I know you invested a whole heap of money on my say so I in turn will do everything I can to make sure this cruise will exceed your wildest expectations. My best to you all. Here as requested is my mailing address and many thanks for thinking of me. GUIZELL FROM THE BIG EASY – By the time you have read this you will be home following your cruise here on the Carnival Freedom. I will have spoken to you and hopefully we have become great friends. JOHN FROM ARKANSAS – I am so excited to hear that you have signed up for the bloggers cruise in January and what a birthday your wife will have. The bloggers cruise is going to be very special and I am continuing to work on ideas for the cruise. I remember Carl from Tampa very well and he was a major star on the Crnival Liberty. 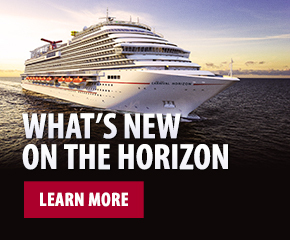 Maybe it’s your turn on the Carnival Freedom in January? By the way, when I was first a cruise director, I was hosting a talent show on the Carnivale and said our next guest is from AR…KANSAS…………oops. See you in January mate. CINDY BRUCE – I am smiling from ear to ear at the comment you stuck on the blog stating you found my voice “SOOTHING.” I just told Heidi and she said you wouldn’t find me soothing if you saw me actually making the announcement in my Fruit of the Looms. Oh well, I guess TV would not be for me then, better try radio. I wish you were here to Cindy and I will keep writing my blogs in the hope that it will keep you going until you cruise again. PAPANH – You will buy 10 copies of the book………..wow. I guess I had better press on with this project then. Congratulations on being married for 40 years and I hope that Heidi and I are Lucy enough to be married for that and more. You are correct, she is the boss and I would not be the man I am without her. OK, she’s gone in the next room. I am the boss, I am the king of my castle and I can do what ever I like when………………ssssssssssssshhhhhhhhhhhh, she’s back ! You asked if I will be on the Carnival Freedom in February 2008. I am not sure yet what my schedule is past January but hopefully I will see you then. My best wishes to you and your good lady. PAULMEDIK – Paul, you asked if I will be on the reunion cruise on the Carnival Freedom in April. I think there is an excellent chance I will be as just after that cruise we will sail back to Europe for the 2008 season. I will be doing a few cruises before I go across to the Carnival Splendor so I think I may get to see you. I hope so anyway. Please keep reading the blog thingy. MISSINGTHESMOKEFREEPARADISE – I always feel guilty when I type those words as I know how much you miss it. I to love Big Band Music and there will be lots for you to enjoy on the cruise. I will make sure Charlie and the guys have some of your favorite Benny Goodman Tunes ready for your enjoyment. I played the trombone when I was young (ger) and my Dad and I loved to go to the Pier Hill Festival and the Three Band festival where we would listen to all our favorite musicians including Don Lusher, Buddy Rich and Ron Ware. Thank you also for your kind wishes for my break. It was too short but I had a wonderful time. You are correct, the ship was in great hands with Heidi. The only problem is my desk. I can’t find anything, she cleaned it and everything is neat and tidy……………….is nothing sacred? Tme to drop something on the bathroom floor tonight. As for the comment you made about airline seats getting smaller, you are correct. The seat on my plane was tiny and although I ignored Guido through the use of my non-working MP3 player, however, we becoming good friends as my thigh and his thigh went through a strange mating process, if only, just once, I could get a seat next to a beautiful woman…….maybe Angelina Jolie although the chances of her flying on this particular budet airline are about the same as me ever having an Aston Martin………oh well. Keep reading and keep writing and lets change your screen name to LOOKINGFORWARDTOTHE NEARLEYSMOKEFREECARNIVALFREEDOM. NOTE TO ALL BLOGGERS – If I have not replied to previous older comments and I said I would get back to you and have not, please can you remind me what is outstanding. I want to make sure I do not leave anything unchecked. SHEREE – Many congratulations to your daughter on graduating college with such high honors (spelt correctly). I am sure you are very proud of her and this I am also sure will have got you through the terrible surgery you had to endure. I hope your forthcoming Carnival cruise will help you recover and if you need anything while onboard, please let me know. Now, as for your tour questions let us start by confirming that Carnival does have representatives at our listed hotels who can organize pre-cruise tours. These include all the major sites as well as exclusive views in the Vatican. If you do decide to book a hotel through Carnival, we will arrange all the transportation to and from the vessel and of course your tours as well. If you would like a hotel recommendation, please let me know. I am here to help you. As far as a tour on debarkation day, I recommend you take The Rome At A Glance Tour which will drop you back in the center of Rome near the Vatican in time for you to take your Necropolis. So, have a think and stay in touch via the blog. Congratulations to your daughter and I hope the surgery has gone well. KEVIN AND SUE – hello my friends, it has been too long since we have sailed together. How are you? So I see you off again, this time on the Carnival Valor. Great ship and wonderful ports. You asked for tour recommendations, here are my favorites. BELIZE……………………Simple…….CAVE TUBING. It is brilliant and gliding down the calm waters in an inner tube is a incomparable experience. The caves are amazing and the jungle surroundings are truly breathtaking. Did you know that the British Special Forces (THE SAS) do their jungle training in Belize? Take this tour, you will not regret it. I DID HAVE ONE PROBLEM ON THE TOUR, MY ……..UMMMMM……..BOTTOM………IS A BIT LARGE AND ….UMMMMMM HUNG A BIT LOWER OUT OF THE BOTTOM OF THE INNER TUBE. CONSEQUENTLY, I PICKED UP A FEW SOVENIRS THE TRIP DOWN RIVER ! COSTA MAYA…………..This is how Cozumel used to be years ago. I recommend the BEACH BUGGY TOUR. Driving a buggy around the unspoiled beaches of Costa Maya and having a swim in the Caribbean Sea. Heidi loves this tour as do I.
ROATAN…………………No idea, never been, but let me ask the cruise director over there, Chris Jefferson, for his personal recommendation and I will stick it on to the next blog thingy. Pirates, Birds & Monkeys”, “Canopy Tour & Tabyana Beach”… they are the best. Thank you for your kind words. I think you will love Chris. He is a fellow Brit and he will provide you with wonderful fun and entertainment. I miss Corey! Hope we see each other very soon and Heidi sends you her best. NANCINURSE – I am thankful to you for your vacation best wishes. I had some fun times with Mum and dad and also got to see my niece and nephew and my mates Alan and Danny. The only downfall was the car. Heidi has bags that are bigger than that…………….I need an Aston Martin (said in a pitiful sad voice). I am glad you enjoyed the Hula Lessons on the Carnival Spirit and I really will do my best to add more ” local ” entertainment to the program. See you soon and thanks for your continuing support of the blog. ASHLEY BLAIR – Angelina and I have a serious relationship and it is not to be laughed at…..well, maybe a bit. How is it being the older sister to 18 year old twin brothers. can you tell them apart? Congratulations to them on graduating high school, let me to if you want me to ‘ have some fun at their expense ” ? Sorry to sound really thick, but you said they are heading for UT, was does UT stand for? I was voted ” most likely to do nothing special ” at college while my mate Alan Adkins was voted ” Most likely To have Every female In The Human Race Find Him Boring and Ugly “. When are you cruising ? Thanks for the comments and please keep reading the blog. BILL – So you think you have the winning entry for the name the Spa on the carnival Splendor contest do you. Well, here are my entries and I think you will find they are hard to beat. In reverse order. 3. JOHN’S GYM…….The idea here is to have new state of the art equipment like Escalator Master with Angelina Jolie look a like fitness instructors who teach you how to eat a cheeseburger while working out. Hope you are well Bill and please keep the fun replies and comments coming. TAZMAN – I am glad you are enjoying the blog every day. I am sorry that there are some days that I miss but I will continue to do as many as I can. You asked about the difference between a cat 6 cabin and a cat 6E family cabin. The cat 6E is on deck 11 and the cabins are bigger with a sofa that turns into extra bedding, great views from those cabins by the way. You must have some amazing stories to tell from your sailings on the Queen Mary and Raffaello, can you share any with us? I know the Carnival Freedom is your first taste of our cruise line. Rest assured that we will all be dedicated in making sure that we give you and your family wonderful service, fun and the finest entertainment at sea. If I cannot find a belly dancer by the time you sail, then I will do a dance for you myself……bring a camera……………………..with a big lens. See you in July. THAIS AND FABIAN – It’s great to see new people post comments on this blog thingy, so I welcome you today. Eugenio your cruise director on your Costa cruise sounds fantastic. Your wonderful comments about me made me blush, so thank you so very much for what you said. You have cruised a lot haven’t you and I know that the best is yet to come when you sail on the carnival Freedom later this year. In answer to your question, you can indeed enter the Spa Naming contest even though you do not live in the U.S. and I will also add you to the YES column for the addition of a belly dancer to the program……….even its just me doing it. I hope you have a good flight and as much as you hate flying remember the reward is a fantastic cruise waiting for you. Tot Ziens. PAULETTE’S MUM – I love black pudding! I think you should cook some for Paulette. How is she by he way? HOTLANTA – I am happy to hear the information I sent you for the tours has proven useful and I am sure you and your group are getting excited now. Please try to arrive to the vessel by 3 pm. This will give you some time to unpack before sailing and the welcome aboard talk with me. Remember we sail at 7 pm sharp. I had a great time with Mum and Dad and thanks as always for you kind words. See you in June. TOM POTTER – What a great comment you have glued to the blog. Your cruise director on your Carnival Miracle cruise will be Brent from Canada. He is a very funny (slightly ugly) young man and I know he will add to your cruise enjoyment. He is very personable with bags of energy and please if you have time send him my best regards. As a star of the Welcome Aboard Show I know you enjoyed your “15 minutes of fame.” That is my main purpose as a cruise director on stage, it should always be about the guests, never about the CD themselves. I enjoy nothing more than seeing a guest recognized the entire cruise for their exploits on stage. I hope you and Peggy are well and I appreciate your time in reading this blog thingy everyday. FRANCOANDLYNN – June 6 will soon be here. You asked about the supper club and what night to eat there. Really, the answer is any night and maybe apart from Venice night then I think the second sea day is also great as it is right in the middle of the cruise. Your 14-year-old is most welcome and I am sure it will be a family night to remember. Thank you for wishing me a nice break, I had such a brilliant time at home. See you in June. ADIAS.ANGEL – That’s another plus in the hire a Belly Dancer column. How about a duet. me and you? That should be quiet an attraction for the lobby. I have lots of ideas for the Carnival Splendor. I have already mentioned the beer fest and how about some Russian music for our time in St.Petersburg? All the best until we see you next year and please keep reading the blog thingy. IGGIPOLKA – What a perfect segue, here is a real live belly dancer who reads the blog. Your statement that belly dancing is a wonderful expression and celebration of culture has made my mind up………ROGER (my boss) are you reading this? Can you teach me to belly dance – not you Roger, I mean Iggipolka. DOUGNEWMANATSEA – Hello mate, how are you? Thanks for your comments about the Web site, I always appreciate your comments and expertise. Please have a look now and tell me what you think and any suggestions you have to improve what I am doing. Thanks for the nice words, I did enjoy my brief holiday. Please write soon. CATMAMA – Thank you for your support of the Blog Book. I can picture the cover now. Me and Angelina both wearing swim wear lying across the front of an Aston Martin. 220 days and counting to your cruise. C U then. HOTLANTA – Don’t worry about asking questions, that is my purpose of this blog so ask away. In answer to your credit card questions, Vis and MasterCard are both equally excepted all over Europe so you have nothing to worry about. With the exception of Dubrovnik, Izmir and Istanbul there are many ATM’s that issue Euros in all the ports of call. My time is your time, so no need to apologize. See you very soon. 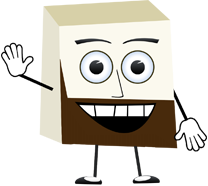 OK, ITS TIME FOR THE WELCOME ABOARD SHOW……………………….BACK SOON. OK, I AM BACK, DID YOU MISS ME? TIMOTHY PORTEE SR – This has to be one of the best comments I have personally received. The fact that you were about to quit on taking Carnival Cruises but because of the fun we had together back in 1997 on the Imagination which rejuvenated your love of this great company, well, I have no words. Congratulations on your Platinum membership and also for being a travel agent that sends us so many customers. The word thank you is not enough. ZSOLT – I want you to know that your Mum remains in mine and Heidi’s thoughts and prayers. We felt so bad when she had to leave the ship but I know that she will get better and we can all be together again soon. I mailed photos and a DVD to you on Wednesday so hopefully you should get them soon, let me know when you do. Until then, I remain your friend always. DORTHE CALIMBAS – I know how you feel about Yorkshire Pudding, they are so Moorish. I only had one though (well, maybe seven). My dad loves Yorkshire Pudding, he likes to pour treacle syrup in the middle of them. My Mum also makes the best roast potatoes nice and crispy. Anyway, back to the real world and bread and cheese for the next eight months. Thanks for your comments and hope to meet you one day soon. CINDY BRUCE – Thank you for your kind words. It is great to know that I have such good friends made through this blog thingy. Please keep reading it and I wish you all the best. VICKI AND MATT – I had a wonderful time at home at my Mum appreciates all the happy birthday wishes so much. My best to you and Matt. MRS K.L – OK, I have had a brain fart. Remind me what I was supposed to follow up on about “Jess?” feel guilty because I can’t remember what I said I would do for you so please jog my memory and write soon. NANETTEALI – Heidi here, thank you for asking how I am doing. I am fine and it is good to have John back although the desk is now a complete tip again. John sends his best and we thank you for all your nice words. HOTLANTA – You asked about the garbage crisis in Naples. There was a situation where the garbage men/women went on strike but this was resolved as of a few days ago. I was in Naples yesterday and all the garbage had been collected as normal. The only smells in the air were of pizza, so all is well. PAULF.PIETRANGELO – Your comments are never a “waste of my time,” mate. This blog has become so much more than just cruising information. It’s about 5,000 people each and every day reading and writing their thoughts and wishes and emotions to each other and long may it continue. I am glad you got through the difficult times with the damage to your house and I am sure Heidi and I will do the same. Please keep reading and please keep posting your thoughts and comments. Cheers mate. STORMIN NORMAN – Welcome back from the Carnival Valor. I hope you had a great time and I am sure as always you contributed to everyone’s enjoyment. I hope that we will be reunited on the Bloggers Cruise. I really want Heidi to come to Australia but she is so afraid of spiders she won’t go. She heard about the spider that lives in the toilet and crawls up and bites on your bottom. Any advice on how to change her mind? THE CHADS – Mary, I am equally excited that you have decided to book the bloggers cruise. Please call your travel agent and tell them to call Carnival reservations and mention that you want to book as part of the bloggers cruise so you get all the benefits. I look forward to meeting you and Randy very soon……..quick…………….book now as there are not many cabins left. Let me know when you are confirmed and see you soon. MARY AND RANDY – You are correct, that might be a bit awkward if I see Sarah, but I hope she reads this blog and realizes that cruising more than any other vacation is perfect for any and every age group. I am going to work very hard to help promote cruising back home in the U.K. starting with my friend Sarah. Thanks for writing and see you soon. CARL AND BARB THE TEDDY BEAR – I thought about sending a brochure to the agent who knew nothing about cruising but I felt that might seem a bit condescending. Instead, I am contacting our head office in the U.K. and I know they will “re-educate her” toward the wonders of the cruising. Thank you for saying Brad Pitt has nothing on me, If only Angelina would see that…………………..maybe she will when she is codmother of the Carnival Splendor. Thanks to you and Papa Bear. GREG – Ahhhhhhhhhhhhhhhhhh, tennis fans. Yes, we will have some Wimbledon coverage for you and I am sure it will be fantastic to see how long it takes before Roger Federer wins again, there really is nobody to compete against him at the moment. I miss the old players, McEnroe, etc who threw rackets and swore! You will soon be here and what a great way to celebrate your 20th anniversary. See you then. PETER WARD – What a fantastic group of friends and family you have sailing in September. Stromboli is indeed a wonderful sight to behold and I hope it is in a very naughty mood when we sail past it. I do know West Didsbury near Manchester in fact one of our entertainment staff Gary is from very near to there. I am glad you like the blog and I look forward to meeting you in September. CAROL SCHOENBERGER – I think Sarah the travel agent was just programmed to promote Sandals but I will change her mind as I have a cunning plan up my sleeve. I had a nice time at home so thanks for asking and I hope to hear from you very soon. JO MYERLY – This reply is simple. As a travel agent who promoted Carnival like you did I thank you for seeing past your nose and looking at what today’s Carnival is all about. We are where we are today because of people like you……………………THANK YOU. CRYSTAL – June the 6 will be here before you know it and I am sure you have started getting your suitcases ready. You asked about the average age of the guests and the answer is around 50. There will be approximately 200 kids and many families onboard as well so we are lucky enough to have a whole cross section of people. I look forward to sharing time with you onboard as does Heidi. SARAH RAYMENT – DAVIES – hello Sarah, sorry I didn’t get chance to mention you yet but I am rectifying this now. It’s been many years since we have seen each other and I send my best to you and your beautiful children. Alan is the same as ever, shy and slightly feminine but some things never change. Hope to see you soon and please feel free to share any stories you remember about Alan and I from years ago as 300,000 bloggers would love to know I am sure. Ok, that sees the end of today’s Q & A. Again, sorry it took so long to get your comments answered but I think I have caught up now. It is now the formal sea day before Venice and I have just finished the captain’s cocktail party and I am now getting ready for the show. Its been a busy few days with me flying around but all is well. Tonight I also had the good and the bad. The bad. A very upset lady was so angry and accosted me in the lobby. She had been told by a member of staff that she could not reserve a whole row of seats and said that if she got there first she should be able to save seats for her friends. I explained that we did not allow this and it was a strict policy. She said I was doing this “because I am Chinese.” I felt my blood pressure rising at the mere suggestion that this was the reason. I tried my best in a calm voice to explain that this was not the case but all I got was a finger pointing in my face and a sentence shouted at me in Chinese which I am glad I did not understand. The thing that upset me the most about this situation was that it went unresolved as she walked away and would not listen to my reasoning. I hate this and now it will play on my mind for days to come. And we went to listen to the best jazz band on the seven seas, The Gavin Ahern Trio. Sitting next to us was a young man with a group of friends. I went to chat with him while the band was on a break, his name is Rick Arlane. The reason I went to speak to him is I have never seen a man so into the music he was listening to. His face shone and he moved to every beat of the music. When I say he moved, he was moving with the help of his electric wheel chair. I spoke to him and he answered me through the use of a voice generated computer and the words “I LOVE MUSIC” were some of the most special words Chris and I had ever heard. I then had a long chat with his companion and best friend Jamie. He explained that Rick had been confined to the wheelchair and as he is for the last four years following a motorcycle accident. Jamie explained that Rick had been a budding musician and was studying music at a University in Texas. His love of music has not diminished even though he is facing unbelievable challenges. His love of music was clear for all to see. Tonight, this job, yet again has enabled me to meet a very, very special person. OK, it’s time for bed. This was a very long blog and probably the most unstructured one I have written but I wanted to catch up with the questions and comments. Tomorrow I will start my daily blogs again. I am being told to hurry up by Heidi so to avoid the doghouse being a permanent place of residence I had better do as I am told.